Please refer to the section in the Bridgeway Moodle course for the curriculum assigned to your student for more detailed instructions on scoring your student’s work. 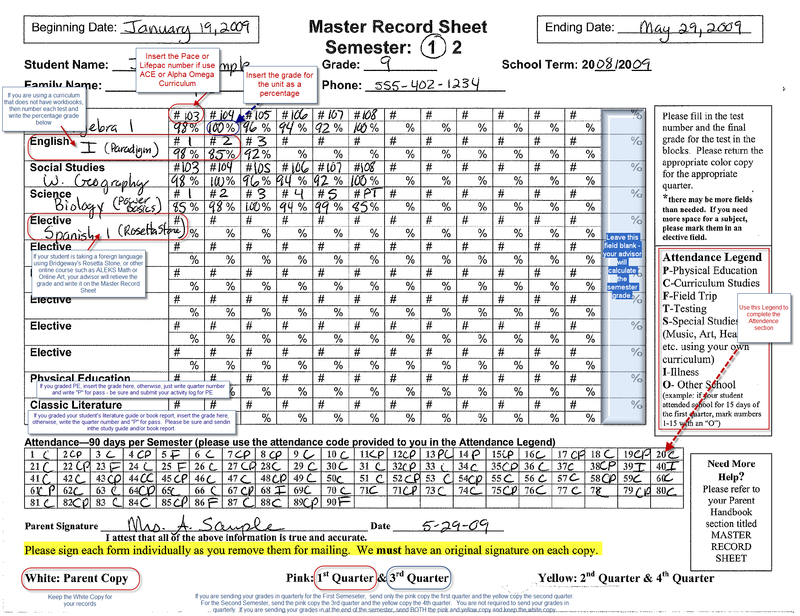 You can access a pdf version of the Master Record Sheet in the Bridgeway Learning Center under the Forms & Documents tab. Fill out the student’s first and last name. Fill out the parent/legal guardian’s name that is overseeing the student in their schooling in the family name field. Fill out the beginning date and ending date for the semester for which you are submitting grades. Fill out the parent/legal guardian’s phone number. Fill out the year of the current school term. Write the name of each subject for which are submitting grades. Follow the guidelines below based on which type of curriculum you are using. Traditional curriculum contains grade reporting instructions on the corresponding instructor guide or teacher's guide for each course. If you are using a unit-based curriculum, write the numbers of each book that you have received next to the # sign. If you are using a textbook curriculum write the chapter test or unit test numbers next to the # sign. You may also write page numbers. If you need to enter a score for a paper or project, label the project as P-1, etc. and enter the grade next to the % sign below the corresponding paper or project. Directly under the test number or unit number, record the score that the student received on the final test next to the % sign. Average the scores for each subject and enter the semester average in the final box for each subject. The attendance legend is located at the bottom of the Master Record Sheet. On the attendance grid put a slash (/) through the days when you are schooling. Attendance should be recorded on a daily basis. Attendance is not required by Bridgeway, but may be by your state. Check your state guidelines. This is your official attendance record and it is very important to keep this document current. Please sign and date each form, each semester. Once you have input all grades on the Master Record Sheet, upload a copy to the Bridgeway Learning Center. We recommend that all materials be submitted electronically.